Bordeaux is the name that rolls off the tongue of wine lovers round the world. It is the most respected red wine region in the world, producing quality red wines made primarily from blends of Cabernet Sauvignon, Merlot and Cabernet Franc grapes. These wines are known by the wine region and /or appellations that they come from. Villages and wine areas such as Margaux, Pauillac, St Estephe, St Julien, Médoc, Haut Médoc, St Emilion, Pomerol, Graves, Sauternes, Barsac, Premières Côtes de Bordeaux, Bordeaux AOC/Bordeaux supérieur, Entre Deux Mers, Côtes de Castillon, Fronsac. So you have heard of the wine regional names, now is the time to plan your wine tour of France, to enjoy the historical villages, to taste the wine right in the vineyards and to savour the fine food and cuisine of Bordeaux. Situated in south-west France and located halfway between the North pole and the equator, the Bordeaux wine region stretches from the Atlantic Ocean along the Gironde Estuary and follows the Dordogne and Gironde rivers inland for over 200 kilometres. Presently 120,000 hectares are under vines making it the second biggest wine region in the world, behind the Languedoc. Over 700 million bottles of Bordeaux wine are produced every year, ranging from large quantities of everyday table wine, to the most expensive and prestigious wines in the world with one third of all the good quality wine in France coming from the region. Bordeaux wine is made in 9,000 wineries called “châteaux” from the grapes of 13,000 grape growers. There are 57 appellations of Bordeaux wine. The soils of Bordeaux come from limestone geographical structures and are heavy in calcium. It is composed of gravel, sandy stone, and clay. The region's best vineyards are located on the well drained gravel soils that are frequently found near the Gironde estuary. Most of the grapes grown in the Bordeaux region are for red wine, mostly Cabernet Sauvignon and Merlot along with some Cabernet Franc. Merlot is the most planted grape in Bordeaux, covering 50% of the wine region. Bordeaux white wine grapes make up less than 10% of vines and are mostly Sauvignon Blanc and Sémillon, with some Muscadelle. Wineries all over the world aspire to making wines in a Bordeaux style with a special blend of Merlot, Cabernet Sauvignon and Cabernet Franc, but what they do not have is the magical ingredient; the terroir - the specific combination of soil, position and climate. So come and savour the wine in its own environment - the Bordeaux wine region. The locally raised beef, lamb and ducks make the perfect wine match with wonderful Bordeaux red wines. 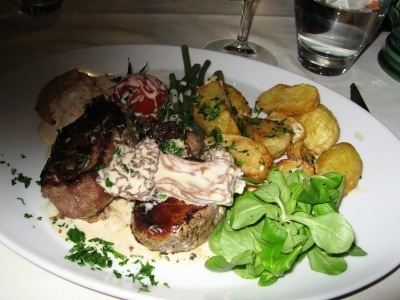 Typically you will find Agneau de Pauillac (lamb that has been raised on the salt marshes) and often served with truffles, as the region is known for truffles and mushrooms. And with your lamb enjoy a AOC Pauillac wine like 2010 Chateau Haut-Bages. You will find a number of dishes from lamb, beef, poultry, rabbit, pork, lampreys, even fish and vegetables, prepared à la bordelaise, which usually means in a sauce made with red wine, ham, butter, shallots, thyme and parsley with perhaps a dash of cognac. While enjoying the reds, don’t forget the fine white wines both dry and sweet that Bordeaux produces, and that go with the fish and shellfish from the Atlantic and the Gironde estuary. For more temptations Bordeaux FOOD & CUISINE ..
Chateaux - centuries of English occupation and influence can be seen in chateaux and churches. Historical villages - step back in time in a 700 year old hilltop Bastide, Cadillac, with its fortified chateau, ramparts, and fortified gateways. Or others like Hastingues, Labastide-D’Armagnac, Rions, St. Macaire to name a few. Beaches - un-crowded Atlantic coast beaches with golden sands that go on for kilometres. Gironde estuary - famous for its mussels and oysters. 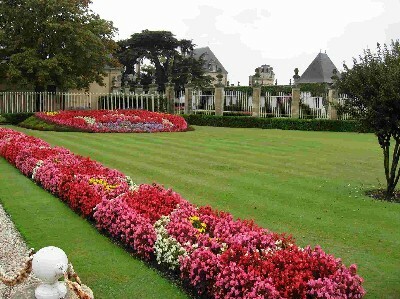 Architecture - Bordeaux has long been the playground of kings and famous people who have created magnificent buildings. Unique foods and Cuisine - this is a land of beef, lamb, pork and poultry, fish and great shellfish—so enjoy the cuisine and savour the wonderful wine and food matching that Bordeaux offers the visitor.